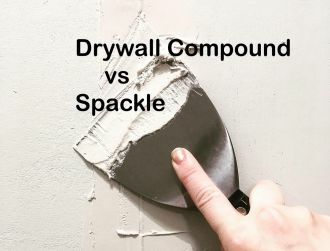 Joint Compound vs Spackle, Which One Should You Choose? Joint compound and Spackle are two fantastic products that are designed to help you fix the imperfections on the walls in your home. However, when faced with the decision of having to pick between the two, which one should you choose? Although personal preference definitely plays a role, it really comes down to what you’ll be doing with it. Before we continue though, it’s important to have a good understanding of what joint compound and spackle are. All-Purpose Compound: Can be used for all phases of the patching process. Topping Compound: Made to be spread on a wall with two dried coats of taping compound. Taping Compound: The first and second coat of compound you want to put on. Quick-Setting Compound: Made to dry faster than the other compounds and works great for deep cracks and wide holes. Spackle on the other hand is a name brand product made by Muralo Company. It resembles paste and comes in lightweight Spackle and heavy Spackle. Lighter Spackle is generally made from vinyl and used to smaller fill holes made by nails, pins, and needles. Heavier spackle is made from acrylic and typically used for larger, thicker holes. Spackle also is sold in pre-mixed containers for easy use, but for those that are interested, powdered mixes are also available. To keep the powdered mixes from going bad, make sure you only mix enough for the job you’re about to do. Joint compound is the better choice for taping and finishing drywall seams whereas Spackle is the better choice for filling in small to large sized holes in your walls. Now, that doesn’t mean you can’t fill holes with a quality joint compound, but joint compound typically dries much slower than spackle. In fact, after you fix a hole with spackle, the surface can be sanded and painted within an hour whereas when you fix it with joint compound, it’ll take a lot longer to dry. Another advantage to Spackle is that it doesn’t shrink as much as joint compound once its fully dried. Because joint compound shrinks so much, multiple applications are usually needed to get the surface fully finished. Spackle also shrinks, but it just doesn’t do it nearly as much as joint compound. These extra joint compound applications are both time consuming and sometimes a hassle. Lastly, Spackle is much easier to use that joint compound is. Most all Spackle comes in a convenient container ready to use, and although a lot of joint compound does too, there are some you have to mix yourself before can apply it. Spackle is also a thinner paste that’s easier to spread. However, unless you want anything more than a slim layer, joint compound is probably the better choice. Although Spackle dries much faster than joint compound, doesn’t shrink nearly as much, and is easier to use, joint compound is much easier to sand down. In addition to this, joint compound is also more dense, thicker, and all-around durable. The best part? You can use multiple layers to fill in and thicken up certain areas of a wall. This is just something Spackle can’t do. The price between joint compound and spackle is another difference worth mentioning. Since joint compound is usually used to cover large areas, more of it is needed. As a result, the overall cost is typically higher. However, Spackle on average is more expensive, but because you don’t have to buy as much, you end up paying less. Fixing a few small holes in the wall don’t require than much Spackle but covering the joints between panels does require quite a lot of joint compound. Even though joint compound usually comes in larger and more expensive qualities, it doesn’t dry out as fast as Spackle. In fact, Spackle dries out much faster. The best thing you can do, whether you’re using Spackle or joint compound, is to make sure you put the lid back on the container when you’re finished using it. This will keep your joint compound or your Spackle fresher for a longer period of time. When trying to decide whether to use spackle or joint compound, always consider the job at hand. If you’re just trying to fill some holes and want to spread a thin layer, then Spackle is the best choice. However, if you’re trying to cover a large area, thicken up a wall, or you want a surface that’ll be easy to sand, then joint compound is the better pick. The end result after using joint compound (left) versus spackling (right). When your drywall needs to be repaired, you have the choice between joint compound and Spackle. Typically, joint compound is used to cover the seams that lays between two pieces of drywall. Spackle on the other hand tends to get used more to cover holes. If you’re planning on using joint compound, you’re going to need joint tape. This will allow you to cover the seams. Cut the tape to the exact length you’ll be needing. Once you have the tape cut, stick it onto the seam. Do this for all the seams you want to cover. Equip yourself with a trowel. Use the trowel to spread a layer of your joint compound over the seams. Let the joint compound dry. Inspect it to see if more applications are needed. If so, add them and let them dry. Sand down the surface for a flat, smooth-looking wall. You can now paint or tile your drywall the way you want. The thing that you need to remember about joint compound is that the more compound you put on, the more you’re going to have to sand down. This excess sanding can cause a lot of dust to fall onto your floor and in the air you’re breathing. So, use it sparely. Equip yourself with a putty knife. Spread some of the Spackle in and over the hole you’re trying to cover. Once the holes are filled and covered, let the spackle dry. Sand the surface down until you have a smooth surface. After you have sanded down the surface, you can then paint or tile your wall the way you want. Just as with the joint compound, use Spackle sparely to avoid excess sanding and dust. So, is joint compound the same as Spackle? They’re similar to one another, but each one also has their own purpose. Joint compound is the best choice when it comes to fixing large holes and cracks in addition to covering the seams between two pieces of drywall. Spackle on the other hand is the more appropriate pick for smaller jobs like covering nail holes and other minor blemishes on your walls. Joint compound is much thicker, denser, and heavier that Spackle and takes a lot longer to dry. With Spackle, you can apply it and be painting your walls within the hour. That’s just not the way it is with joint compound. You have to give joint compound adequate time to dry. Joint compound is sold in 1 quart containers to a 5-gallon buckets. If you have a lot of area to cover, then the larger bucket is the better choice. Since Spackle is used sparely, it’s usually sold in smaller containers for a lower price. Now that you know just about everything there is to know about joint compound and Spackle, you should have no problem deciding which one is the better choice. It really all comes down to the kind of job you’re needing to accomplish. Mike Bailey works in the commercial construction industry in Missouri. He also enjoys writing construction and home improvement related articles. Benjamin Moore vs Behr, Which Is the Better Paint? Oil-Based Paint over Latex: How to Paint the Right Way?